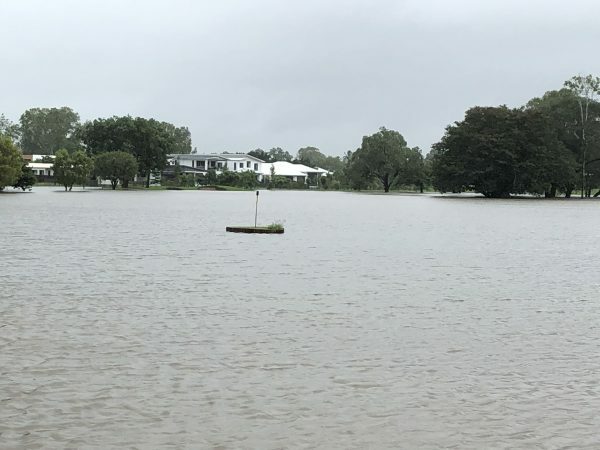 TOWNSVILLE’S three major golf courses – Tropics, Rowes Bay and Townsville – certainly felt the full brunt of the monsoonal rains that lashed north Queensland in early February. The major rain event dished up varying levels of damage with Tropics Golf Club being the least affected. They had a number of holes open for play just days after the deluge, but at Rowes Bay Golf Club it was bad. It was heartbreaking to see fairways under water, but there was some good fortune with the putting surfaces remaining above the water level. Unfortunately, the 125-year-old Townsville Gold Club, Queensland oldest golf club, wasn’t as lucky. 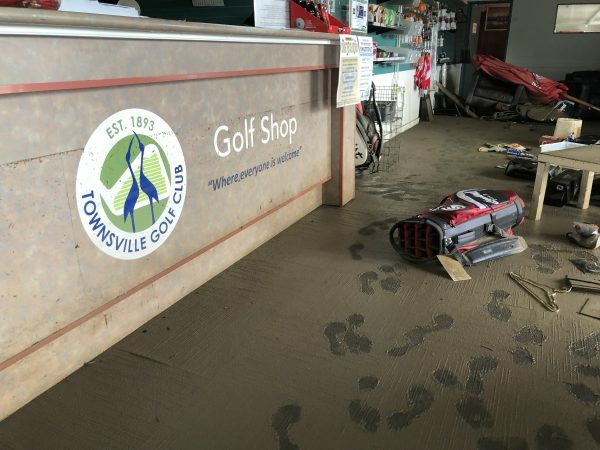 As much as two metres of water covered the course and the clubhouse was severely damaged when water poured through the roof, flooding clubhouse, pro shop and men’s locker room. The members’ cart storage area too had a significant amount of water through it. Townville Golf Club’s general manager Mitch Bligh told Inside Golf on February 8 he didn’t know when the course would reopen for play. “The greenkeeper, Jason Forster, said with luck and no more rain we may have some holes open in three weeks (early March),” he said. “We had five brand-new holes under construction and all of them were under water. “We haven’t been able to inspect them, but we do know one of the new greens was washed down the Ross River and one of the new tees beside it went as well. “They have gone down the river somewhere. Insurance assessors spent a day inspecting the clubhouse damage. “We had water come through the roof of the clubhouse and all the carpets have to come up,” Blight said. Still, Bligh remains positive the club will be back on its feet soon. “It’s heartbreaking but these things test us and we move forward and away we go again,” he said. “The community of Townsville has been fantastic through this ordeal and the members of club have been nothing short of superb. “We have a big job ahead of us, but everyone is positive. Jason Forster (head greenkeeper) has had volunteers from Brisbane, Cairns and different areas come and give us a hand. Meanwhile, Townsville GC’s staff has been out in the community helping the clean-up and removing destroyed furniture. “Today our course staff and bobcat was working tirelessly helping residents in the nearby streets,” Bligh said. “We have a big challenge ahead, but we as a club are ready to tackle anything put in front of us. Meanwhile, over at Rowes Bay Golf Club it’s slightly better news. 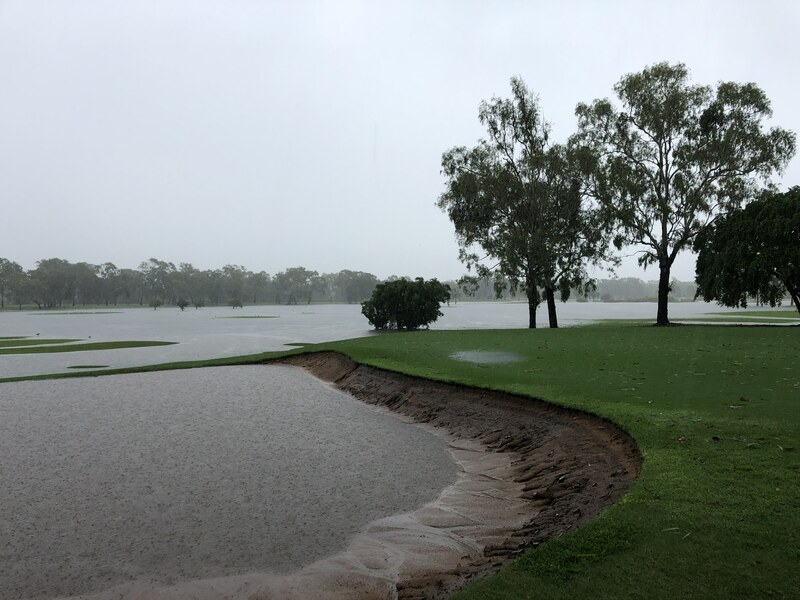 “It’s heartbreaking to see the course under water, but we are lucky our greens haven’t gone under and the clubhouse and pro shop is fine,” general manager Gary Toplis said. At the time of writing, Toplis was unsure when the course would reopen for play but suggested the par-3 course would open within two weeks (around February 23). “We are pumping one million litres of water out a day,” he said. “Normally with big rain events and cyclones we have been back playing in three or four days, but this time it could be about a month. At the time of writing, Rowes Bay members were chomping at the bit to get in and help the clean up. “We have had a lot of members email us offering their time during the clean-up,” Toplis said. Toplis said the club would apply for government grants to help in the recovery. Over at Tropics Golf Club, the course’s back nine holes reopened for play just days after the rain stopped. The club’s general manager Matt Duke said the course recovered quickly courtesy of new drainage installed late last year. “I was keen to see how the new drainage systems would perform in Townsville’s wet season, but never expected the workout it received,” he said. “We had been concerned about waters rising from the on-course lakes and the river next to the course, but the biggest issue was flash flooding from neighbouring streets. “We’ve actually received a number of calls and messages from our residential neighbours, whose homes also experienced reduced flooding thanks to the improved drainage. All 18 holes opened for play (walking golfers) on February 9-10 and carts were back on course a few days later. “Tropics Golf Club would like to acknowledge the major contribution of Brett Langtree from Langtree Consulting for his expert hydrology and stormwater knowledge and advice that has allowed the course to implement flood and stormwater mitigation measures that not only minimised the damage to the golf course but also ensured that the floodwaters did not breach one house adjacent to the golf course,” Duke added. During the rain event a crocodile was spotted near the second hole. “We’re certainly looking forward to the sun coming out so we can start to see whether our regular freshwater crocs have made it back to their lakes,” Duke said. Inside Golf urges golfers travelling to north Queensland in coming months drop in a play a round of golf or two and spend a few bob on food and beverages. They’d welcome you and would appreciate the support.